How are Kuwait’s CEOs responding to the renewed impetus for economic reform? As I write, oil prices have exceeded $80 a barrel for the first time in four years, marking a clear statement of intent from the Organisation of the Petroleum Exporting Countries’ decision not to increase output at their recent Algiers meeting, despite US President Donald Trump’s request that they do so. Supply has tightened, not least because of political woes in Venezuela and renewed sanctions against Iran set to come into force in November. This, combined with the ratcheting up of trade war rhetoric between the US and China, and ongoing volatility between Gulf states and Iran, looks set to ensure higher oil prices are on the cards. All this means that receipts for oil exporters such as Kuwait are on the rise. This is, on the face of it, a good thing, but belies the fact that it was only during the past four years, when oil prices bottomed out, that some of the thorniest economic reform issues were actually addressed, despite years of talk about diversification. Like the other Gulf states, Kuwait has an economic roadmap – the Kuwait National Development Plan (KNDP) – which embodies the objectives of Emir Sheikh Sabah Al Ahmad Al Jaber Al Sabah’s Vision 2035. This seeks to transition the country into a trade and services hub, particularly servicing the northern parts of the Gulf. A key element of this, as with all such strategies, is an enhanced role for the private sector. Kuwait’s prosperity has meant that it has traditionally been a net exporter of investment. Indeed, this strategy has led to Kuwait Investment Authority (KIA) to become one of the largest sovereign wealth funds in the world, reported to have close to $600bn of assets under management. A major part of the KIA mandate is to act as a fund for future generations. To this end, it has largely been successful, but as recent oil price fluctuations have shown, sustainability is everything. As Kuwait more actively courts inward foreign investment, the focus is less on providing funding, though this is important, and more on the ability for investments to match the government’s key economic development objectives – and, crucially, to stimulate the private sector and create job opportunities for nationals. The authorities have committed to invest some $100bn in infrastructure, which has often been a source of frustration for businesses, particularly the restrictions on land development, as too has red tape and parliamentary bickering, which have combined to create delays on numerous projects. So how is the business community reacting to the renewed impetus for economic reform? In our most recent survey of CEOs, 61% of respondents have positive or very positive expectations for business conditions over the next 12 moths, 25% are indifferent or do not know, and 13% are negative or very negative. Interestingly, the share of positive or very positive responses was lower than in most of our surveys conducted in other GCC countries. I don’t personally think that this is particularly notable, though, as the Kuwaiti business community, and indeed society more broadly, has a rather freer attitude towards speaking one’s mind. What I think it does reflect is the need for the business community to have confidence not only in the infrastructure in Kuwait, but also the regulatory frameworks, which are often cited as needing reform. Further, they need to know that the parliamentary process is not going to stymie progress on either front. The benevolent nature of the Kuwaiti state has meant that reforms in areas such as subsidy reduction and taxation – value-added tax for example – have been met with stiff opposition. As a result, the broad welfare bill for 1.4m citizens has grown enormously. Perhaps, then, it should be no surprise that 90% of those surveyed view the current local tax environment as competitive or very competitive by global standards. However, this is an area where if the goals of the KNDP, and the recommendations of bodies such as the World Bank and IMF are to be met, some short-term pain is going to need to be inflicted. Indeed, in many senses this should perhaps be an easier sell to citizens who have more of a political voice than their GCC neighbours; however, time and again Parliament and the public reject revenue-raising measures, which will sooner or later be necessary. This fact is underscored by the dependence of the national workforce on government employment, further weighing down on the state. About 21% of nationals currently work in the private sector, and increasing this percentage is a key tenet of economic reform plans. As elsewhere in the region, the private sector relies heavily on imported labour, with nationals having an ingrained preference for public sector employment. Furthermore, more that 60% of the national population is under 30. This youth bulge, which is increasingly tech savvy and with a comparatively high level of disposable income, should be well suited to the nature of modern business, so much of which is done in cyberspace. 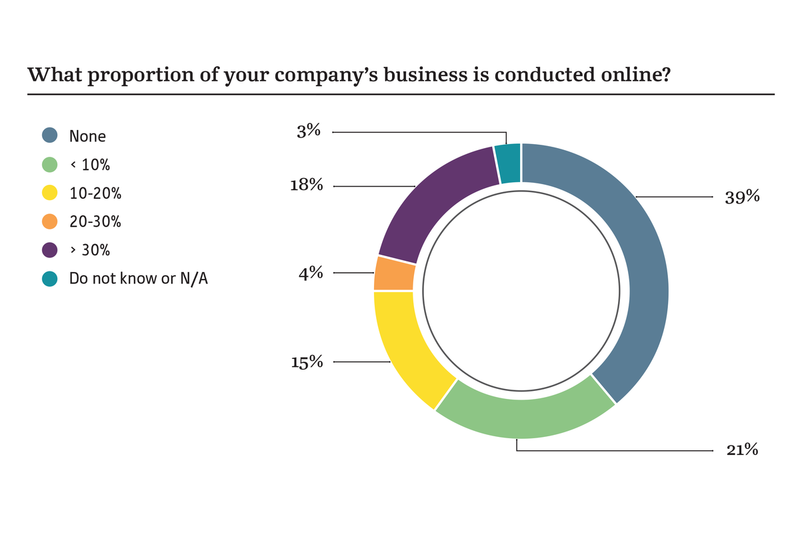 Tellingly, though, 39% of our respondents say that none of their company business in conducted online, and only 18% say that more than 30% of their business was done digitally. This shows that there’s a significant opportunity for businesses to grow online. One of the other labour market issues that Kuwait faces is that of educating young people for the jobs available in the private sector, and in many metrics there is room for improvement: the World Economic Forum’s Global Competitiveness Index for 2017-18 ranked Kuwait 95th out of 137 countries for the quality of its higher education and training. Indeed, education and skills transfer are central parts of the Vision 2035 strategy. Kuwait is not alone in its ambitious vision for a future diversified away from hydrocarbons, but oil will continue to account for the bulk of revenue for many years to come. As I have said in this blog before, diversification is not, and should not, be a severance from oil, just a better use of revenues derived from it. It’s for this reason that we do not include commodity prices as one of the options for top external factors with the capacity to impact Kuwait’s economy in the short to medium term. In response to this question, 66% of those surveyed felt regional political volatility was the biggest challenge, followed in equal measure by Chinese demand growth (3%), a eurozone crisis (3%) and multiple US Federal Reserve interest rate hikes (3%). The reform process in an economy with a significant level of state benevolence is never going to be easy; neither is changing the reputation, both locally and globally, of a very rich economy where restructuring and any new project is beset by delays and parliamentary dithering. There is evidence that this could be changing, however: the Sheikh Jaber Causeway, an iconic, multibillion-dollar bridge project, is both on time and on budget, according to industry press. The concern now, as oil hits $80 a barrel again, must surely be that the foot comes off the diversification pedal. Here’s hoping it does not.